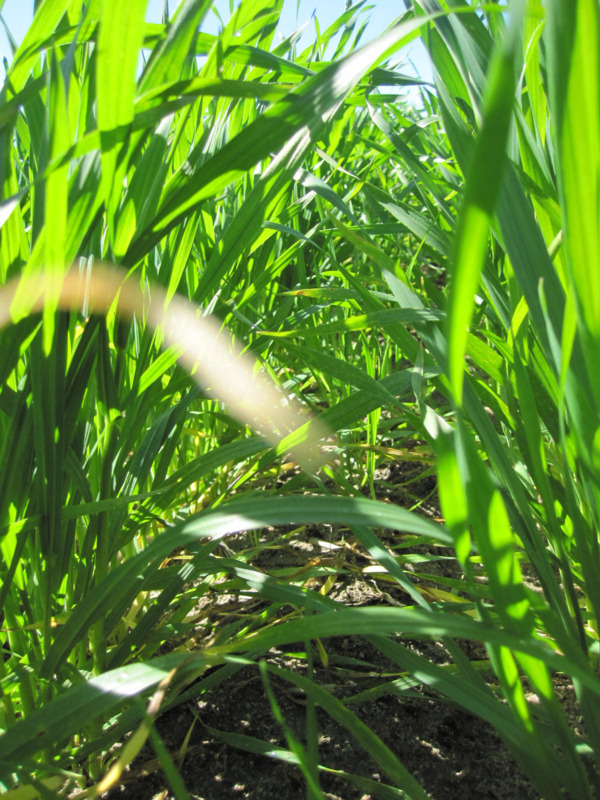 Every grain grower has seen how well weeds grow when they have a blocked seeding tube creating extra-wide row spacing. Instinctively, we all know how important crop competition is for good weed management. The competitive ability of cereal crops can be increased by orientating crop rows at a right angle to the sun light direction, that is, sow crops in an east-west direction. East-west crops more effectively shade weeds in the inter-row space than north-south crops. The shaded weeds have reduced biomass and seed set. The advantage of this technique is that it's free! The competitive ability of cereal crops can be increased by orientating crop rows at a right angle to the sun light direction, that is, sow crops in an east-west direction. East-west crops more effectively shade weeds in the inter-row space than north-south crops. The shaded weeds have reduced biomass production and reduced seed set. In particularly weedy fields, the reduced weed growth leads to increased crop yield. Altering the orientation of a broadleaf crop has less impact on weed growth. This is because broadleaf plants will alter the angle of their leaves over the course of the day to 'track' the sun as it moves across the sky. Therefore, as the leaves of the broadleaf crop move to catch the most sunlight, they cast less shade over the inter-row space. In paddocks with a high weed burden, crop orientation has a significant impact on crop and weed growth. Trials at Merredin and Beverley in Western Australia (2002-2005) indicated that weed biomass was reduced by 51% in wheat crops and 37% in barley crops, when crops were sown in an east-west rather than north-south orientation. Grain yield increased by 25% in wheat and 17% in barley crops. When the weed burden is low (due to herbicides use) the impact of crop orientation on grain yield and weed biomass may not be apparent. However, there is still a significant reduction in weed seed production. Trials at Merredin, Katanning and Wongan Hills in WA (2010-2011) indicated that annual ryegrass seed production in east-west wheat and barley crops was halved. Annual ryegrass in east-west crops produced an average of 2977 seeds per square metre (seeds/m2), compared to the 5691 seeds/m2 in north-south crops. The only exception was Katanning 2010 where annual ryegrass emerged two weeks after the crop, ensuring that the crop was highly competitive regardless of crop orientation. Table 1 Annual ryegrass seed production/m2 in east-west and north-south orientated crops, at six trials in WA. Seed production was reduced in east-west crops in five out of six trial sites. Consider the weed species in the field. Broadleaf weeds can alter the angle of their leaves to 'track' the sun throughout the day. So while a cereal crop can shade broadleaf weeds, the weeds will still be able to get maximum benefit from any sunlight that reaches them through the crop canopy. Further, any weeds that grow taller than the crop will not be effectively shaded by the crop canopy. Consider the layout of the paddock. It may not be possible to sow a paddock in an east-west direction, depending of the shape of individual fields. Consider the location of the paddock. The sun angle in winter is highest at the equator (where the sun is close to being directly overhead at midday). Sun angle becomes lower south of the equator. A low sun angle in winter will cause an east-west crop to cast shade on the inter-row space for a great proportion of the day. Therefore, a crop orientation will have a greater impact in southern Australia, compared to northern Australia. Using an east-west orientation may be more practical with auto-steer. Without auto-steer, driving directly into the sunrise/sunset for seeding/spraying/harvest of an east-west crop will be unpleasant and potentially dangerous. 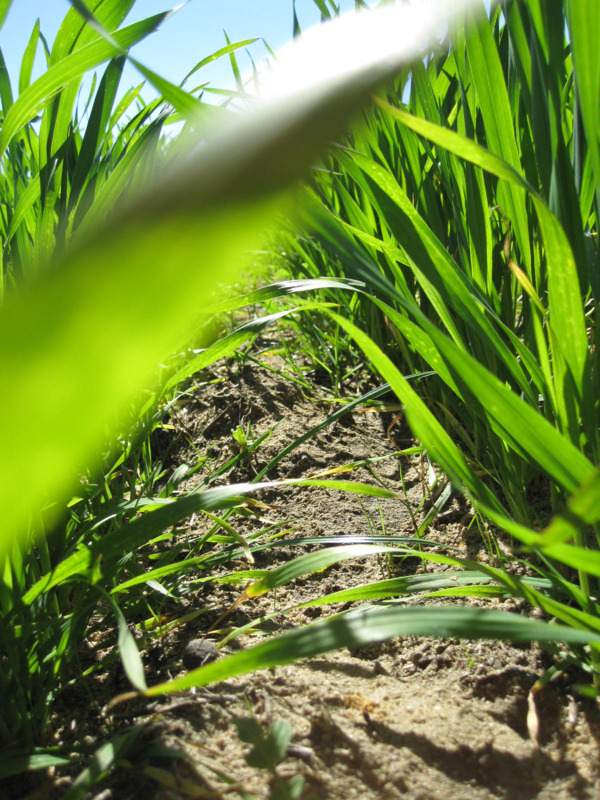 Increased shading by an east-west crop reduces the soil surface temperature in the inter-row space and reduces evaporation, leading to increased soil moisture. This increased moisture occasionally increases crop yield where moisture is limited. However, the cool, moist environment of the inter-row space may influence the development of crop disease in some locations (although altered levels of disease were not noted in previous trials).